Pick a star, and head on ’til morning. I was asked during the week if I could speak from The Late Late Show audience in favour of water charges. As it happened, I couldn’t, as I had a prior commitment. But to be honest, if I was free, I’m not sure I would have agreed anyway. Fair play to the RTE researcher who was diligently trying to get some pro-water charge voices into the audience for balance, but the bear-pit format of RTE audience debates on political issues is so awful that I avoid them. It’s not just RTE either. I’ve been elsewhere, and there’s an over-emotional sound-bite culture that drives the format now. No room to make longer points, or actually debate comments from others, and an obsession with getting “as many voices” into the debate, which favours 15 tiny slivers of opinion over say, 4 people discussing an issue. When you’re in the studio, you can see the “Be short, be short!” look of panic in the producer’s eyes, which is understandable. He or she is just doing their job, but it doesn’t help inform anybody. Surely there’s room somewhere in the Irish media for a show with a long discussion and a modest number of participants? The new polls from Scotland are fascinating, pointing to a Labour meltdown in the next year’s general election. Now, All four of Britain’s main parties look like getting screwed by First Past the Post in different ways, which must be a first. There’s also the possibility of the SNP holding the balance of power, which will be very entertaining. Turns out the Brits may not need Proportional Representation to look like Italy after all. Yet still the Tories won’t concede that FPTP is an electoral system for a different age. Check out Peter Kellner from Yougov’s Scottish poll analysis here. The other interesting/milk out of nose from laughing development in UK politics is that the rise of UKIP seems to be making the EU more popular in Britain! UKIP’s repellence towards many voters seems to have made them look at the EU again on the basis of “If these guys are against it, can it be that bad?” Be funny in Nigel Farage turned out to be the man who saved Britain in Europe. Of course, don’t forget the EU’s ability to be its own worst enemy. Watch how the latest row over EU money causes a sharp drop in support. Posted by Jason O on Mar 30, 2014 in Jason's Diary, Not quite serious. There’s a small but committed group of people who when they hear the name “Benedict Cumberbatch” don’t automatically think of “Sherlock Holmes” but instead think of “Captain Martin Crieff”. 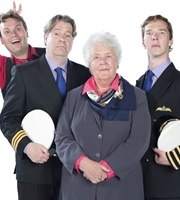 Cumberbatch plays Crieff in the BBC radio comedy “Cabin Pressure”, which tells the misadventures of MJN Airlines, a single plane charter airline struggling to keep going. MJN is owned by Carolyn Knapp-Shappey, played by the excellent Stephanie Cole (who starred in the underrated 1990s sitcom Waiting for God as the sharp tongued retirement home resident Diana), assisted by her over-enthusiastic son Arthur (John Finnemore, who also created and wrote the show). Cumberbatch plays Crieff, who is chief pilot merely because he agrees to work without pay, such is his love of flying. Finally, there’s the excellent Roger Allam (Peter Mannion in The Thick of It) who pretty much steals the show as the dry-witted fixer co-pilot Douglas Richardson. The humour is gentle but genuinely funny, and proof once again that good comedy doesn’t always have to be edgy, sarcastic or vicious. The final episode has actually been recorded, and will be broadcast in December, and the entire series is available on Audible.